Bijou Was an "Experimental Research Subject"
After weeks of negotiating, we were finally able to get Bijou and his brother Seymour to his new and permanent home at Peaceful Prairie Sanctuary. Bijou and Seymour were bred to be part of a University livestock “experimental program.” These programs are funded in part by our tax dollars through the Department of Agriculture. The University program’s research is conducted with a view to increasing the livestock industry’s profitability, through mechanization and other means, at further expense to the billions of individual animals raised and killed for food annually. Fortunately for Bijou and Seymour, their birth defects made them ineligible for research. Bijou was only two months old, weak, and very undersized, with bowed back legs. Seymour was also undersized, nearly blind, and has deformed back legs, which make him a little wobbly when he walks. Precious little Bijou was so weak when he arrived that we weren’t sure he would even make it through the first night. We have given Bijou lots of TLC and he is still nursing from a bottle, but is growing nicely and is getting bigger and stronger each day. 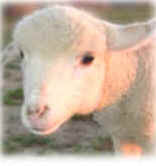 Here at Peaceful Prairie Sanctuary, Seymour has chosen Doris, an elderly ewe, as his adoptive mother. Seymour tries to stay close to Doris at all times. He has acclimated beautifully to his new home and herd mates. Although a little clumsy at times, Seymour walks and runs alongside the other sheep while they explore the prairie. Each evening they come back up to the barn where he cuddles up next to Doris for the night. Bijou delights and charms all visitors with his sweet face and adorable little “Bahhhh.” No matter where he is, he comes running when he hears his name. He loves people and will steal your heart!